Folks, I’m a bit concerned. Because apparently summer is over and I feel that it went by WAY too quick to be natural. I mean…I vaguely remember the heat, people sitting in the parks, going to a couple of festivals and enjoying some wonderful pilsners, saisons and wheat beers…but now it’s all over and suddenly it’s light sweater weather and my little beer fridge is filled with Fall seasonal beers. I’m not sure if it was aliens or an alive and well Nikola Tesla screwing around with the universe, but things seem a little too…rushed, you know? 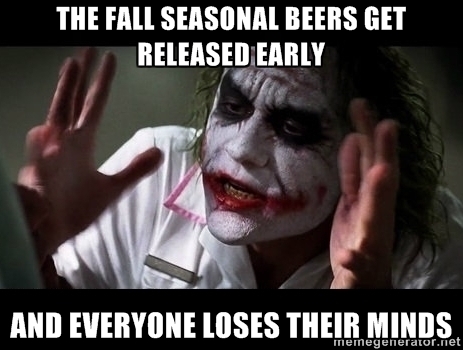 So a summer post IS coming, it is…but I just wanted to remark on how fast Fall has hit us and even hit the beer shelves. September JUST hit and Pumpkin beers, normally a favourite of OCTOBER, are already out. A lot of them have been out since the end of August and many more are on the way soon. So with pumpkin beers coming early, we’re getting people who complain about pumpkin beers coming early and then people who complain about the people who complain about pumpkin beers coming early…and so on. Just another day on the internet. But WHY are they coming early? Well, several reasons, but the biggest one is high demand. Despite the many people whinging about pumpkin spice being added to beer, it’s a popular autumn drink. The increased demand is forcing breweries to brew earlier so it can hit as many stores and bars as possible with some regularity for the season. I recognize that it’s a sign of the seasons being rushed (I’m one of the many to complain when I start hearing Christmas music in stores the day after Halloween), but if it’s being done to put more money in the pockets of breweries and increases the regularity of the style of the season, I’m for it. And for those of my readers who absolutely hate the Pumpkin Beer style or are really annoyed that they are on the shelves this early, I have amazing news for you: You’re a human being capable of independent thought! You have the amazing ability to purchase whatever you want whenever you want! You prefer an IPA? Well go off and buy an IPA and may the winds bless you. Run! Run in the fields and dance the dance of life! Previous Post Will It Grow? Part 2: We Rise! We Live! Amen, sister! I’m not always a big fan of the pumpkin beers, I find some of them come off perfumey or artificial tasting. That said, I’m ready to welcome back the Oktoberfests, brown ales, harvest ales, porters and stouts for another go-round. Hopefully this season I’ll be able to put a dent in some of the cellared imperial stouts from last season. I’m pretty excited to see Black Butte Porter in the LCBO for the fall release. It used to be one of my favorites when I lived in Oregon. I’m looking forward to that one too! Also loving that iStout will be released here, as that’s a lovely one as well.